CHP Billet 9310 Transmission shaft for your KLX110. Manufactured from 9310 High Nickel base Super Alloy, used in Helicopters, Z06 Corvette and Viper performance transmissions. Case hardened and precision ground to exacting tolerances, delivering a yield strength of 146 KPSI, 8 times stronger than the stock material. Delivering reliability to your KLX110 motors, now that you have tweaked your motor from 6HP to more than 15 HP. No need to gamble your motor on the stock $50.00 cast scooter transmission shaft. Manufactured in the USA with consistence and exacting tolerance that you expect and will receive with this high performance product. This is the ONLY billet transmission shaft on the market and our shaft does not break and the teeth on the gear do not break. 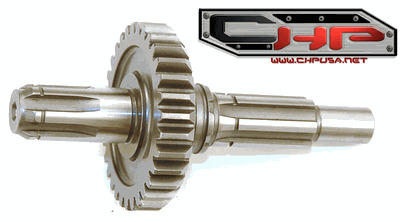 This is 100% re-engineered billet machined transmission shaft 100% sourced and manufactured right here in the USA. More than 2 1/2 years in production with NO FAILURES. We now have a 100% replacement warrantee to the original purchaser. 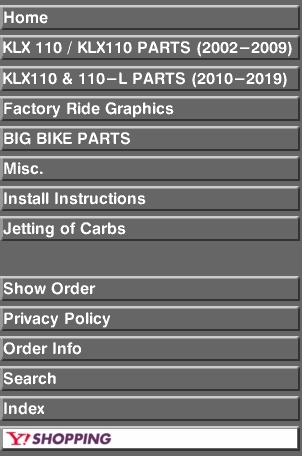 If our shafts breaks, due to normal operation and has not failed due to another parts failure, we will replace it FREE! Is this faith in our product or what? No other company or product can make this claim. American quality, manufactured by Americans, designed by Americans and sold by Americans.